Local technology firm Appsolutely is hosting a two-day event focusing on the current pace of developments in blockchain, as well as a look at its future prospects. 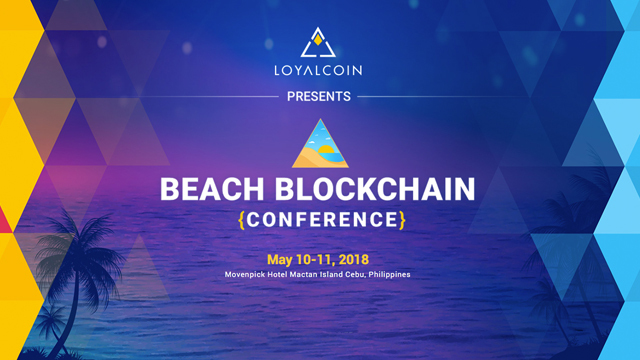 Called the Beach Blockchain Conference, it will be held on May 10 and 11 at Mövenpick Hotel in Mactan Island, Cebu. “Since blockchain here in the Philippines is really at the very early stage, we’d like to pay it forward by conducting this blockchain conference,” said Patrick Palacios, CEO of Appsolutely, in a media briefing held last April 25. “And at the same time, [we’re] helping the Filipino startups and the regional startups expand globally through the blockchain. Last year, Appsolutely launched its own digital token, LoyalCoin, which aims to revolutionize the loyalty programs of various businesses by tokenizing rewards points. It is one of very few Philippine-based startups to have successfully completed an initial coin offering (ICO), raising over $12 million from the offer. “We were able to successfully enter the world [of blockchain], and now we want to share what we know,” said Paolo Bediones, Appsolutely’s COO. Palacios called it the country’s “first comprehensive blockchain conference,” and he highlighted that the Beach Blockchain Conference will feature internationally recognized blockchain and cryptocurrency experts who will be speaking in the Philippines for the first time. Among them is Brock Pierce, a former child actor who now heads the US-based Bitcoin Foundation. Last February, business magazine Forbes included Pierce in its inaugural list of the richest people in cryptocurrency, estimating his net worth between $700 million and $1 billion. Other notable speakers in Appsolutely’s lineup include Nicholas Merten, best known for his DataDash YouTube channel that focuses on blockchain-related topics and boasts over 250,000 subscribers; Jeff Berwick, founder of online financial newsletter The Dollar Vigilante, which provides financial advice on cryptocurrency, stocks and investments; and Jeff McDonald, chief technology officer of Malaysia-based startup LuxTag, which provides digital certificates through the blockchain. As well, the Beach Blockchain Conference will hold an ICO pitching competition, where startups from all over the world can present their blockchain-focused ideas and businesses. In the audience will be “whales,” or investors with over 1,000 Bitcoins that are looking to fund new and promising blockchain projects. With the Beach Blockchain Conference, the Appsolutely team aims to not only increase the knowledge and awareness of blockchain technology within the country, but also to promote local developments to the rest of the world. “Through this conference, we really intend to put the Philippines on the map when it comes to blockchain,” said Bediones.